The next time you have an energy slump, make these Chocolate Espresso Energy Balls! 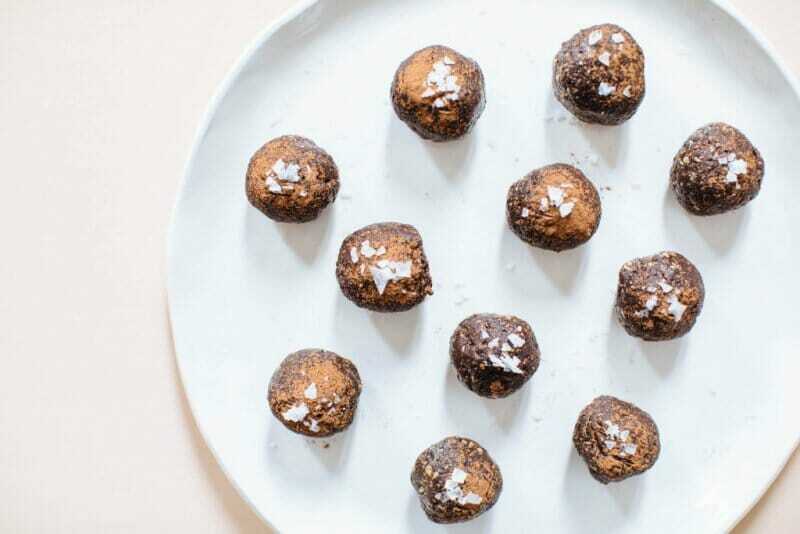 Chocolate Espresso Energy Balls are a quick and easy snack to boost your energy levels with a little espresso and healthy fats to keep your hunger at bay. They’re made with dates which are rich in fiber and potassium and a source of simple carbohydrates — our bodies primary and preferred energy source is sugar — and a mix of healthy fats, plant-based protein, and minerals. Tahini, which is made from sesame seeds, is incredibly rich in calcium. Sesame seeds are great sources of magnesium, calcium, iron, zinc, molybdenum, and selenium. Copper has been shown to help relieve inflammatory diseases such as arthritis. Other minerals found in sesame seeds such as magnesium, calcium, and zinc have been shown to help with colon cancer, prevent migraine headaches, PMS, reduce bone loss and support general bone health, support respiratory and heart health and reduce cholesterol! Fiber from the dates, coconut, and nuts and seeds all help keep our digestion working properly and running smoothly if you know what I mean. This includes everything from the act of consuming food, breaking down food, processing, and utilizing it for energy. Healthy digestion will also help your body absorb nutrients from food.